I just drank a bottle of Minute Maid Pulpy. They say it’s got ‘no preservatives added’. Aw, c’mon…It’s bottled juice. Is that even possible? So I thought maybe... it's just one of those common bottled fruit juice that offers a healthy alternative. I didn’t believe it the first time I heard it’s got no preservatives added. So I read the ingredients (even the fine print) and everything checked out! It really has NO PRESERVATIVES ADDED! That means it doesn’t have ingredients that may turn out to be allergens, or worse...carcinogens! Whew! Now that’s healthy goodness that tastes so good, I... love the taste and it's very refreshing. I would always crave for a bottle of Minute Maid Pulpy Orange. So okay, it’s got no preservatives added. That’s really good, right? Not just because it doesn’t have those icky, harmful ingredients, but it also means... it's a healthy habit to drink Minute Maid Pulpy goodness. There's nothing like it! So far anyone who still has a hard time believing that Minute Maid has got no preservatives added - meaning it's THAT natural, it's almost like it's plucked straight from the tree, it's just as Mother Nature wanted your orange juice to be, it's got nothing but the good stuff yes, none of those potentially toxic stuff that can harm your brain, kidneys, heart; cause tumors aargh- the list of preservatives' bad effects just go on!!! Anyway, just to prove a point on just how good Minute Maid Pulpy is 'cause it's got NO PRESERVATIVES ADDED, I'm gonna stock up some boxes of Minute Maid Pulpy Orange because it's good to drink it with every meal, pair it with some chips and crackers or just drink it when I'm thirsty or just want to relax reading a book or listen to some soothing music. P.S. I got interested in joining this blog promo of Minute Maid Pulp Orange when I learned about this from Ms. Janette Toral. I am an avid drinker of Minute Maid products ever since it started invading the Philippine market and I believe so much in the product. Very healthy and refreshing drink! More power to Minute Maid! minute maid is a healthy drink.. Drinking Minute Maid is like drinking freshly squeezed OJ! My OB-Gyne recommends that I drink fresh orange juice during my pregnancy. Whenever I have time, I would squeeze oranges. But most often, I don't have time. So, I just drink Minute Maid. It's like real FOJ! @LOURDES: That surely is heavenly! @TURTLEKEZIAH: It really tastes good! @JASON: I agree. It's a healthy drink! @MONETTE: You're right, it's like freshly squeezed orange juice! @EILEEN: I agree, it's healthy and nutritious. 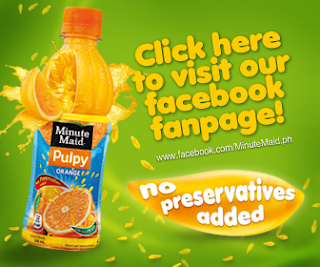 @MAYTREESH: Minute Maid Pulpy is instant FOJ!